How did I wind up quilting during this fine autumn of 2013? I was feeling crafty and pulled the cover off the sewing machine. I had decided earlier this season to focus on crafts where I have some basic skills and a track record (like sewing) rather than taking up something completely new (like piano-playing). 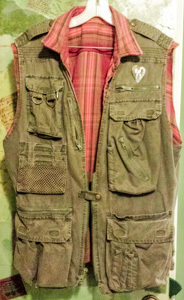 So I finished a little project of lining an old photographer's vest with one of Jim's colorful old flannel shirts (minus the worn sleeves). I like the idea of upcycling or repurposing old clothes. What next? If you read my Waking the Dragon entry, you'll recognize my next step as "abundance seeking." I started pulling apart Jim's overstuffed closet and chest of drawers for more old shirts and trousers that could be upcycled into something... something, you know, wonderful. Found plenty of raw material for projects, not to mention items for Goodwill and "lost" clothes that Jim can actually still wear. So, look, I'm crafty AND useful. Next day we stopped at Barnes & Noble. I was going to look for a book on upcycled clothing projects and/or how to appliqué but I found a couple of neat books on quilting. Dred was fully awake now. Time to play??? We bolted across the plaza to Joann's Fabrics and bought rotary cutters and a cutting mat. Gotta have tools!! Of the two books I bought, the more inspirational was The Farmer's Wife Sampler Quilt: Letters from 1920s farm wives and the 111 blocks they inspired by Laurie Aaron Hird. In 1922, Farmer's Wife magazine sponsored a contest, asking subscribers to write an answer to the question: "Would you want your daughter to marry a farmer?" The best letters are reprinted in this book, along with a different quilt-block design for each. Doing a sampler quilt seemed like a good place to start: no need to commit to one design, lots of variety, lots of learning to see where my skills and interest might lie. Of course, I can't just whip up a quilt. I have to "become a quilter." This means lots of research into how serious quilters organize their material, their tools, their workspaces, and their work processes. I did make a quilt once before, back in my sewing heyday of circa 1975. It was simple shades-of-cream courdoroy squares, hand-tied, made as a going-away present for my best grad-school buddy Roy. It was lovely, but I never found the motivation to get back into it. Now, with YouTube and web pages, there are so many delightful how-tos and inspirations. I could spend all my time "getting organized." 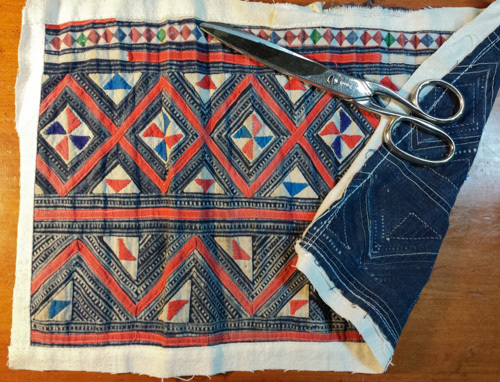 But I guess quilts aren't supposed to be quickly accomplished even with a sewing machine (though there are certain batch techniques used by highly productive quilters). I saw one video describing a complex cathedral-window quilt that had been started by grandma, continued by mom, and was now being passed on to daughter for completion. If quilting is a form of slow-lane meditation, that's fine. If quilting is not going to be a central activity, but one of those relaxation, when-I-have-time activities, that's fine too. But the challenge is that I have to leave the sewing machine and ironing board at the ready in my already too project-intensive studio. Hence, my preoccupation with organizing my space correctly. 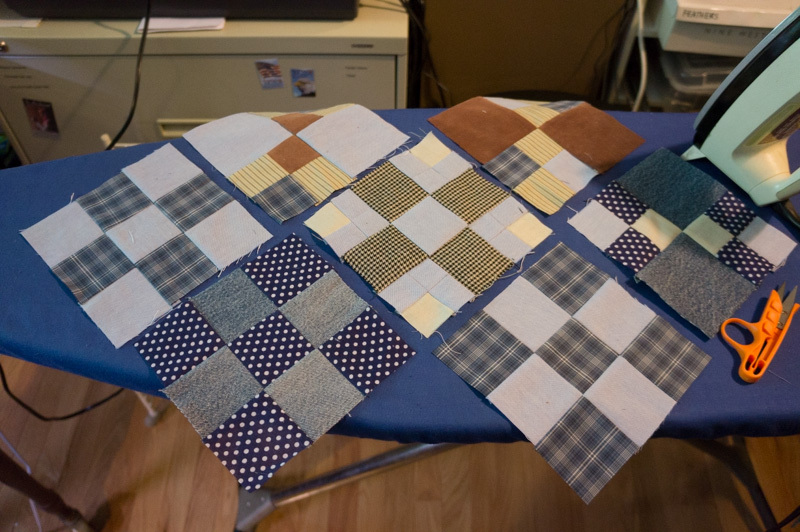 So... my goal is a lap-size (small) sampler quilt, which requires 50 6-inch pieced squares in a variety of designs, which will then have piece-work between them as they get sewn together. Then comes the batting, the backing, the actual quilting and the edge binding of the finished product. That's all. I have to report that after a couple weeks of quilt obsession, I only have 9 squares completed and 2 more cut out. Using recycled men's clothing makes for a muted "guy" palette, but that's okay, I think. Also, I'm happy to report that all my seams meet where they are supposed to (thanks to my mom for passing that aptitude down to me) and lots of unwearable old clothes are exiting the closet for a better life. Top photo: first 7 squares.